Martha Sherpa may not have managed (quite) to convince me of the benefits of making Thai green curry from scratch in my own home (without a blender) but one thing she did do was give me a good idea of what I should expect from a Thai restaurant. I think that was why I was so disappointed by Box Thai. The menu looked great with lots of different options available and the food looked fantastic when it arrived in the serving bowls, but it just didn't taste great. In fact, in places it tasted quite bad - all sickly sweet with no kick anywhere. The starters were by far the best bit with the grilled beef salad being the hands-down winner, closely followed by the grilled salmon salad. The cucumber / lettuce combo below the salmon and mixed in with the beef was fresh and flavoursome with a perfect level of chili. Unfortunately, it then went downhill. The spring rolls were excessively oily and flavourless - to the extent that you could really taste the oil when you took a bite. The papaya salad was perfectly amiable but really lacked the kick that makes papaya salad so brilliant - the powerful but balanced combination of slightly tart green papaya, spicy red chili, salty shrimp paste/fish sauce and sweet honey or equivalent. Even the satay was a bit uninspired - the meat seemed cheap and hadn't soaked up any of the flavours of the sauce. The waiter recommended the Massaman beef curry (which had two peppers out of three next to it on the menu) and pork neck curry with pineapple so that is what we went with. What he didn't explain was that they were virtually identical except for the fact that one had tiny bits of pineapple in it. Neither had any kick in it whatsoever and the overriding impact was of coconut cream and sugar, lots of sugar. I've never had sweet Thai curries before and I can't say I like the approach very much. After a while the Thai green curry arrived. It was marginally more flavoursome but didn't really have that balance of coconut and chili that you might expect. Indeed, it didn't really have any chili at all. On the plus side, the beef noodle dish was quite good. Then the puddings... The creme brulee was seriously overcooked and had become rather rubbery. The tapioca pudding with coconut milk was fine but not particularly exciting. To top it all off, the tables are absolutely huge square tables designed for about 24 people but in such a way that you can't speak across the table. If you are in a group bigger than two you won't get a lot of cross table chat. Aside from seeing the biggest cockroach I have ever seen in Hong Kong (luckily by the door and not by the kitchen), my visit to Tuk Tuk Thai was exactly what I’d hoped for - a relaxed, casual, inexpensive mid-week dinner with friends. The restaurant, conveniently located just off the Hollywood Road, is more of a café in terms of size and décor but, despite its size, the menu is pretty extensive, covering most requirements in terms of chilli levels! P.W. recommended the Larb Gai, or minced chicken with shallots, chilli and lime, and for me, that was probably the highlight of the meal. The flavour was strong and sweet with a good, but not overwhelming, kick of chilli, and the lettuce to wrap it in was refreshing, adding crunchiness. 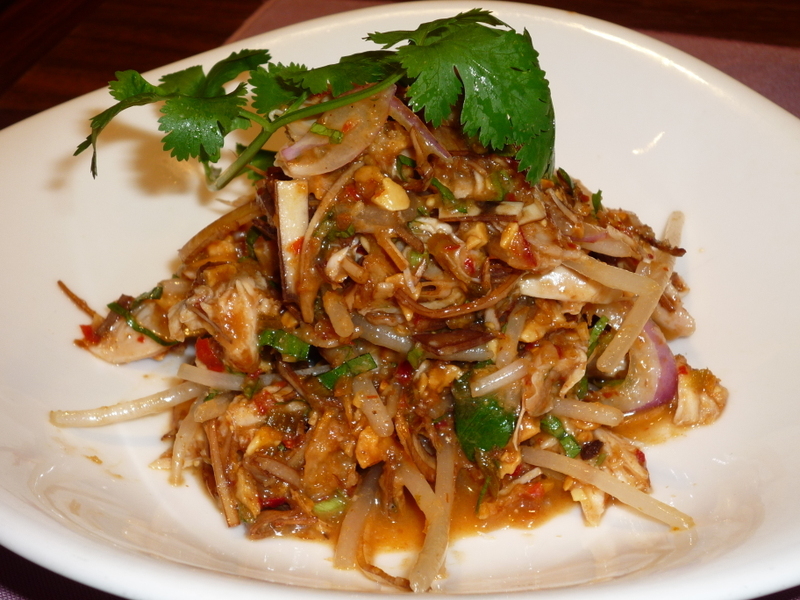 The other highlight was the Pak Boong Fai Daeng, or morning glory with garlic and chilli, which was simple but tasty. To be honest, the other dishes - Kung Phad Med Ma Muang Him-Ma-Pan, or stir fried prawns with cashew nut and dried chilli, and Poo Nim Tord, or soft shell crab with sweet chilli - were a little bit disappointing, not being as flavoursome as the other two, and the soft shell crab was really quite oily. However, the pineapple rice, which my friend P.G. in particular really liked, was well cooked, stuffed full of prawns and chicken. Tuk Tuk Thai is not going to blow you away in culinary terms but it hits the spot as a cheap and cheerful mid-week dinner location. Plus, it has the advantage of being opposite to Berry Good so you can calm your chillified mouth/throat or finish the meal (depending on the dishes you chose) with an interesting flavour of frozen yoghurt such as the green apple flavour they had the day I was there. Tru is one of those restaurants that seems so chain-like from the marketing blurb that you never quite get round to going to it. There always seems to be somewhere a little more "authentic" that you should try. However, I went this week for a work lunch and it perfectly fitted the work lunch requirements: non-controversial Vietnamese-ish decor, smooth service and great lunch set menus. It's not cheap'n'cheerful but the food was interesting, well-presented and tasteful. I think the phrase that best describes the place is probably "reliable" (which depending on how you see it is either damning praise or a great asset). There were four lunch options presented to us, ranging in price from the noodle set to the business set. The business set had a selection of six or so starters followed by six or so main courses then tea/coffee (or a desert for those who want a quick snooze under their desk in the afternoon!). E's Vietnamese spring rolls were good with "thin and flaky pastry" while the traditional banana blossom and shredded chicken salad with chili jam dressing that the rest of us had was really flavoursome. The kick was perfect - enough for you to slightly notice but not enough that you would ever start choking in front of colleagues (or even worse, clients). Authentic? Yes, but a little toned down. I can't say the banana blossom (or banana flower) made a massive contribution to the dish - to be honest the beansprouts were more prominent but I guess beansprout and shredded chicken salad would not have had quite the same ring to it!. Having had a starter with a strong flavour we all chose our main course badly by opting for the salmon fillet with coconut lime sauce and roasted cherry tomatoes, chilli and lemongrass salsa. It was far too delicate after the starter and paled in comparison. There was nothing technically wrong with it, the salmon was well cooked, the coconut sauce light and delicate, the chutney sharp and the cold tomato an interesting contrast. However, it just didn't stand out. Still, tasty nonetheless. With a Rosh Hashanah dinner later that day, I (reluctantly) opted for a peppermint tea rather than the chocolate and mango pudding they were offering. This week is the fourth week in a row that I've promised myself I'd detox - every week gets positively worse so I'm trying to strengthen my willpower! Tru is reliable, a bit of a staple etc... It's probably never going to set your world on fire but equally you're unlikely to have a truly disastrous meal there. Eating at a restaurant should not be an endurance test. Eating at Cambo Thai in Kowloon City was a seriously traumatising experience. As the next phase of my education on "local" cuisine, I decided to try to make myself a little less island-centric, something which my friend N., who lives out in Kowloon Tong, was only too happy to help with. We'd both read good things about Cambo Thai and judging by the massive crowd of people hanging around outside waiting for a table, so had everyone else. Perfect, I thought - an small, authentic "local" Thai / Vietnamese restaurant. Could I be more wrong? Many things are forgivable if the food is great. We should have known it was going downhill when the couple next door, when asked what they'd had, said that it was ok but they'd expected their Thai red curry to have had a little more kick to it - they described it as "canto-fied". We ordered tiger prawns in butter which came seriously over-cooked and not at all fresh tasting - although that may have had something to do with the fact that when they said it was 'in butter' they meant it was drowning in a whole tub of butter, somewhat masking the flavour of the prawn. The Thai green curry was, to its credit, perfectly flavoursome although it was supposed to be Thai, not Vietnamese, and yet it came with French bread and without any 'bite' whatsoever. The fried squid, mussel, shrimp and mixed vegetables was ok although the shrimps were overcooked and the mussels didn't look that appealing. The final dish we ordered was the fried water spinach with Malay paste. Interesting translation because 'paste' it was not. Had it said 'in heavily corn-flowered gravy' i'd have thought that rather more accurate. The food was pretty uninspiring but the service (if you can even call it that) was what made the experience traumatising. The man standing outside dealing with bookings was clearly stressed. Still, we had bothered to book and were happy to wait for a table. There is simply no need as the front-of-house 'receptionist' to be so terse and unwelcoming. When we were allocated a table, the waitress, who didn't smile once during the entire meal, pointed at a table and left, without bringing any menus whatsoever. After waiting 15 minutes, my friend went up to cashier area to grab some menus. Noticing this, the couple on the table next door, looking stressed, said that they'd asked for the bill five times and that they'd had a similar experience throughout the meal. Everything was just too much effort for the waiting staff and they made that very clear, not just to us but to other customers too. So, if you like being crammed into a tiny restaurant with oily, overcooked food and unbelievably rude and unwelcoming service, this is your place. Perhaps, it is the case of a restaurant that has become too popular and has lost the need to try and make effort - after all, the chain has been so successful that it is now made up of three restaurants in a row, each with the same menu. Maybe, I'm just not that knowledgeable about Thai / Vietnamese cuisine and this is actually "authentic" but, frankly, give me Nha Trang any day.